Allow me to introduce you to Orphaned Land, because they are not your usual band, metal or otherwise. Orphaned Land hail from Israel. Their first albums were released in the mid-nineties; they mix death metal with doom metal influences and the traditional music of Hebrew and Arabic cultures. Thing is, it’s not always easy being a band in the Middle East. The second Intifada delayed things, and eight years elapsed between 1996’s El Norra Alila and 2004’s Mabool. The band have grown up amidst conflict and lived with violence and hatred spawned by the confrontation between Judaism, Christianity, and Islam in the Middle East. However, the band do not respond in kind; through their music, they seek unity between the region’s cultures, melding traditional styles with metal and emphasising the ties that bind people together. 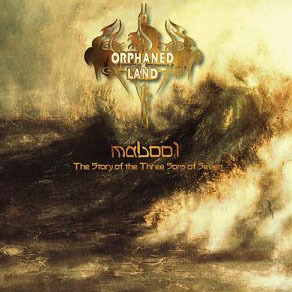 Orphaned Land were pretty determined to make a statement with Mabool well beyond what they had previously released, so they put a lot of time into crafting this album. It paid off. Spectacularly. It is hard to point out a fault on what is undeniably a sensational album laden with cultural, religious, and socio-political symbolism. It tells the story of three “sons” – representatives of the three aforementioned monotheistic religions – of “seven”, symbolic of the god they all worship. The three sons, although in conflict, seek to warn humanity of a coming flood (an obvious allusion to Noah’s deluge), but befitting a metal narrative, they do not succeed and the flood comes. So, yes, it’s a concept album. Surely, 1970s progressive rock has all taught us that it is very hard to make a good concept album – they have a tendency to become bloated affairs that sacrifice good music at the altar of telling a story. No such problems befall Mabool, an album on which every song can be taken in isolation as well as part of a story. It sweeps deftly from thunderous death metal riffing to sombre, meditative acoustic passages with utter ease, and without any incongruity incorporates traditional Hebrew and Arabic folk compositional techniques and instrumentation – even amidst chugging metal riffs. Most of the album is in English, but not all. There are, naturally, growled vocals, but Kobi Farhi is one of the most comprehensible and effective growlers on the planet, and clean vocals dominate – Farhi is no less capable in this department. Every member of the band is thoroughly accomplished at their instrument, but all have the restraint necessary to create a cohesive and tasteful album. Not at any point do individual members hog the spotlight. It is hard to adequately convey in text the stunning achievement of this album and the sonic journey this album takes the listener on. Without question, it is one of the most original albums going around. Illustrative of my point is the eighth track, Norra El Norra. It is a Psalm – yes, a Psalm – sung in Hebrew to metal riffing and a gorgeous keyboard outro. Hardly something you hear every day. One of the great virtues of this album is that it is a great introduction to metal for listeners not accustomed to the genre, but also a breath of fresh air for seasoned and cynical listeners. I give it an emphatic 5/5. Most excitingly, after years of delays, Orphaned Land’s next album now has a release date – 25 January 2010. The Neverending Way of OrWarrior has been arguably my most anticipated album ever since 2006, and just to whet my – and hopefuly your – appetite further, it is mixed by none other than Steven Wilson of Porcupine Tree. SW, tied for the title of my favourite musician with Neil Finn, also provides some keyboard parts on the album. Look for a review here not long after the album leaks.